To celebrate the 250th anniversary of the circus next year, the European Circus Association is working on several projects. Together with international circus historians the ECA plans to publish a brochure that explains the history of the circus and gives a brief overview of the circus today around the world. This brochure will be available in different languages at the beginning of the year and can be used by member circuses in their work with media and other interest groups. Also, the ECA Symposium in Monte Carlo will be devoted to this unique anniversary. The official logo (see above) was designed by MaCiVa in Hungary and will be used by both ECA and FMC. In September, the European Circus Association presented special awards at the international circus festivals in Moscow. At the 12th International Youth Festival in the Nikulin Circus President Urs Pilz and ECA Secretary Dirk Kuik handed over the special award to Vasily Timchenko in honor of his unique work with sealions. And at the IDOL Festival in the Great Moscow State Circus on Vernardsky Prospect, the European Circus Association honored Violetta Alexandrova-Serzh for her traditional dzhigit riding act and smiling presentation. The line-up of circus festivals starts early in 2018 with the festival in Budapest, Hungary, to be held already from 8th to 14th January 2018. MaCiVa, a member of the ECA Advisory Board, is following the 20 years old tradition to organize this festival every other year. There is a special offer for members of the ECA to attend this festival. Please find the details in the members’ section. As usual, there will be an ECA workshop with presentations on Friday morning, 12th January 2016. The title of this workshop will be “Circus Pedagogy”. Members of ENTE will talk about the latest developments in education for travelling children while MaCiVa will present their program of inviting school teachers to hold classes in the circus, bringing circus and school children closer together again. All members of the ECA are invited to join this conference. 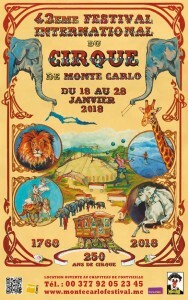 As always, ´the ECA invites its members to the 42nd International Circus Festival in Monte Carlo 2018. All members of the ECA are invited to visit the festival and attend the General Members Meeting and ECA Symposium on Friday, 19th January 2018 in Monte Carlo. Some speakers are yet to be confirmed. 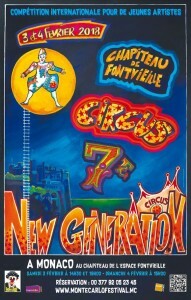 The title of the ECA Symposium, of course, will be: “250 Years of Circus – Circus in Europe Today”. During the last months several circuses decided to join the European Circus Association. We are very happy to welcome Circus Carl Busch of Germany, Antonio Giarola and his Proeventi company of Italy, the State Circus Company of the Ukraine as well as the National Circus of the Ukraine and Britain’s Circus of Horrors as new members. With these new members, the European Circus Association will be even stronger than before!